"Two Tall Tales by the world's top story-tellers in one hilarious All-Cartoon Feature!" A 1949 Disney animated classic starring Bing Crosby, Basil Rathbone and other Hollywood legends, The Adventures of Ichabod and Mr. Toad features two short film adaptations of "The Legend of Sleepy Hollow" by Washington Irving and "The Wind in the Willows" by Kenneth Grahame. The first story is the tale of J. Thaddeus Toad of Toad Hall, an impetuous young toad who is completely taken with every newfangled fad that comes along, including a shiny new motorcar. When his daring escapades land him in trouble, his friends mole, rat and badger come to the rescue. The second short film tells the story of Ichabod Crane, the mild mannered school teacher of a quiet New England town, who finds himself smitten with the prettiest girl in town. His rival for her affections, Brom Bones, tells hims the fearful local legend of the Headless Horseman in an attempt to frighten him off. That night, Ichabod finds himself faced with an all too real headless ghost. 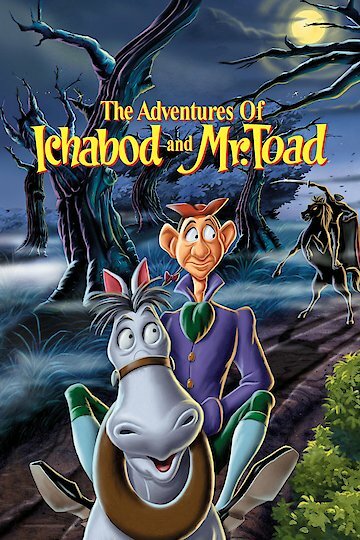 The Adventures of Ichabod and Mr. Toad is currently available to watch and stream, buy on demand at Amazon, Vudu, Google Play, FandangoNow, iTunes, YouTube VOD online.